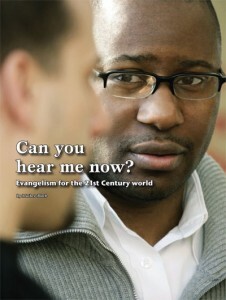 Canadian Lutheran Online » Blog Archive » Can you hear me now? In some ways evangelism is like these ads. We have an amazing message—the Good News of salvation in Jesus Christ—and we want to send out that message. But it is not enough to simply shout it at the top of our lungs; we first have to make sure someone is receiving the message. For it is in hearing the message of grace that people receive faith in the first place. “How are they to believe in him of whom they have never heard?” St. Paul asks before answering himself, “Faith comes by hearing” (Romans 10:14,17 ESV). For Christians then, the question “Can you hear me now?” has eternal consequences. The ads highlight a common problem when communicating via cell-phone: if you go out of the service area, your call can “drop” and end unexpectedly. In the same way, problems can arise when we attempt to share our faith with the world around us. Consider the following story: Andrew is having a conversation with his coworker Chelsea one day when God grants him an opportunity to share the Gospel. Chelsea is quiet for a few seconds. “Oh,” she says simply. A few more seconds pass and then she speaks again. “Well, I guess I better get back to working on that report…” The conversation ends and Andrew is left wondering what went wrong. While Andrew and Chelsea are both speaking English, it might be fair to say they are not really speaking the same language. Even though Andrew gets the Gospel message basically right, he uses so much jargon that Chelsea has no idea what he is talking about. She is listening to the words coming out of his mouth, but not really hearing what he is saying. The fact is, when we want to communicate anything to anyone, it is not only important what we say; it is also important how we say it. Over the centuries, the Church has built up a lot of specialized vocabulary to talk about Christianity. In deep theological discussions we might pull out exotic-sounding words like “homoousios” and “antinomianism.” In day-to-day discussions of our faith we are more likely to rely on words like “justification” and “sacrament.” But if we are completely honest with ourselves, we have to admit that many of us in the pews do not really understand the meaning of “day-to-day” words! If such jargon can be hard for Christians to grasp, imagine how much more confusing it can be for our increasingly post-Christian society. For people outside the church’s walls, even words like “sin” and “grace” have become foreign. For people outside the church’s walls, even words like “sin” and “grace” have become foreign or at least difficult to understand. When we rely too heavily on such Christian jargon, or “church-ese” as it is sometimes called, we are in great danger of obscuring the Gospel of Christ. And while the story of salvation is profound, it surely need not be confusing. For effective evangelism, we need to speak the language of our audience. And this assertion is not based on human invention; it is not part of some “Nine Secret Tips for Successful Evangelism” course. Instead, we speak the language of our audience because God has revealed that as His method. “Now there were dwelling in Jerusalem Jews, devout men from every nation under heaven. And at this sound the multitude came together, and they were bewildered, because each one was hearing them speak in his own language. And they were amazed and astonished, saying, ‘Are not all these who are speaking Galileans? And how is it that we hear, each of us in his own native language?… We hear them telling in our own tongues the mighty works of God’” (Acts 2:5-8, 11 ESV). In this event, God demonstrates powerfully that He is the God of the entire world and not just the Israelites. Every tribe and every people belong to Him. He understands and speaks every language. Unlike in Islam where believers are required to learn Arabic to read the Qu’ran and make required daily prayers, the True God meets people where they are. At Pentecost, God spoke to every person in her or his own language. He does the same today. Here God reveals His desire that the Church’s witness to the world be intelligible to all. It is not enough to merely proclaim the Gospel; the Gospel must be proclaimed in words everyday people can understand. The authorship of the Bible is itself symbolic of that commitment. The New Testament, for example, is not written in high literary Greek. Its authors do not use elite dialects based on “Homeric Greek” or “Attic Greek” —the styles used by such famous men as Homer, Plato, Aristotle, and Euripides. Instead, they write in what is called “koine Greek.” We might call it “street Greek”—the language of the common people. In the writing of the New Testament, God makes clear He is not interested in just speaking to the elites of the Roman Empire; His message was and is Good News for all people. And all people must be able to understand it. That commitment to making Scripture accessible to all people has been instrumental in bringing people to faith and allowing the Church to grow. What began as a German-language project quickly spread across Europe as other Christians followed Luther’s example. Translations of the Bible began appearing in other languages: English, Dutch, French, Polish and so forth. Centuries later that project continues today as groups like Lutheran Bible Translators and Wycliffe Bible Translators work diligently to produce Scripture translations for the millions who have yet to hear the Gospel of Jesus Christ in their own language. Yet the problem of communicating the Gospel clearly is not restricted to overseas missions. It is not just a problem for people translating the Scripture into new languages. Instead, it is a concern for the Church at all times and in all places. As society around us changes, the language we use to communicate with that society must also change. Not so long ago Lutheran congregations in North America conducted services in German—and some still do. As time went on, however, it became clear that change was necessary. English had fast become the dominant language of communication outside the church. If Lutherans were to proclaim the message of Christ to the world around them, they would need to speak the same language the world spoke. The transition to English was difficult for some—an older member of my congregation recalls the battle in his church on the issue. Those against the language change cried, “Our God is German!” But the fact is our God—Father, Son, and Holy Spirit—is God of the entire world—of all peoples, all tongues, and all dialects. He is the God of the boy speaking Zulu on the South African coast. He is the God of the senior citizen speaking traditional Newfoundland English in Eastern Canada. And He is the God of the young mother speaking Mandarin in Taiwan or Vancouver. Today, we face a dilemma similar to that of our German forbears. North American culture has shifted dramatically. As our society moves from a Christian to a post-Christian context, our language is changing. To the world around us, our Christian jargon is becoming just that—jargon. The question for us is, “What will we do about it?” Certainly these words still have their place within the Church, in the education and discipleship of believers; but perhaps a new language is required on the evangelical front lines. Perhaps it is time we begin translating the Good News of Jesus Christ anew for our 21st century audience—not changing the meaning of the message, but nevertheless expressing it in new words. Mathew Block is a freelance writer living in Regina, Saskatchewan where he attends Good Shepherd Lutheran Church.